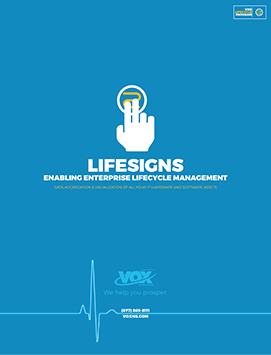 VOX Lifecycle provides a prescriptive, step-by-step methodology and broad range of specialized consultative professional services to ensure efficiency and thoroughness. Organizations that are serious about Digital Transformation are also serious about gaining comprehensive, multi-faceted insight across business units. Our team of experts will help you discover and understand the most relevant impacts and drivers to your organizations health and long-term success. 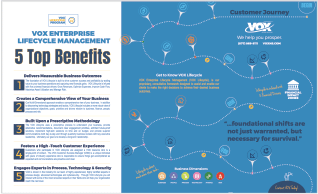 Drive customer success and profitability by adding value to your business operations and capturing new financial gains. 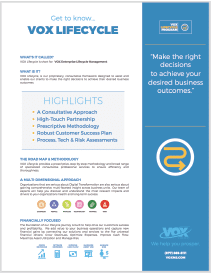 Learn how to maximize the financial benefits with Lifecycle. 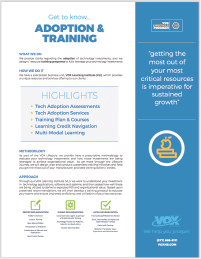 We provide clarity regarding the adoption of technology investments; and we design / execute training programs to fully leverage your technology investments. 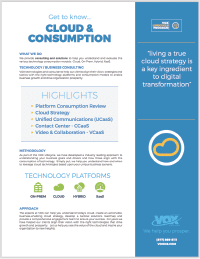 We provide consulting and solutions to help you understand and evaluate the various technology consumption models: Cloud, On-Prem, Hybrid, XaaS. 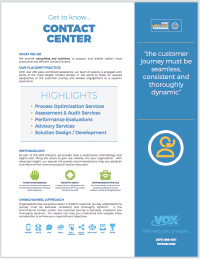 We provide consulting and solutions to support and enable today’s most productive and efficient Contact Centers.